This Fall Fairy Garden Wreath turned out so cute, didn't it?! My favorite part? It only took $3 worth of Fall items from Dollar Tree to transition my original Easy Fairy Garden Wreath, for the Fall season. 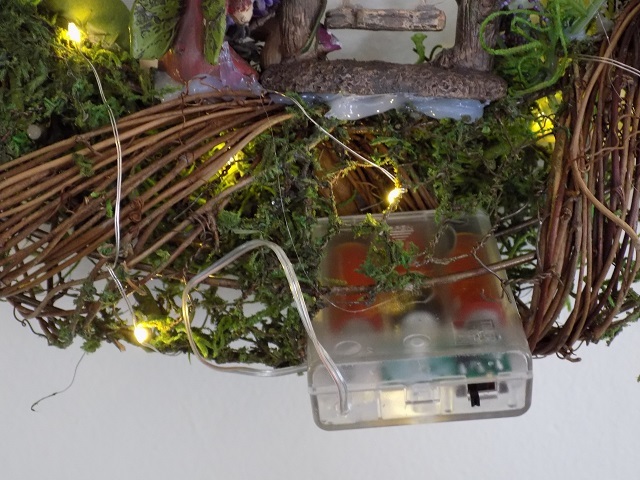 This Fall Fairy Wreath is lighted with micro lights. I love that these little micro-lights are on a timer, so they light up automatically at the same time each day. It gives off such a lovely soft glow at night; perfect for creating a little ambiance and warmth in your home during the Fall months. Hi friends, how have you been? This year I decided to transition some of the décor in my home for the Fall season, with simple updates. Some of the items that I updated for Fall, were still hanging around from Spring/Summer, and some of the Décor was from last Fall and it just needed a little sprucing up. This Fall Fairy Garden Wreath is among one of my favorite DIY Fall updates, so far. 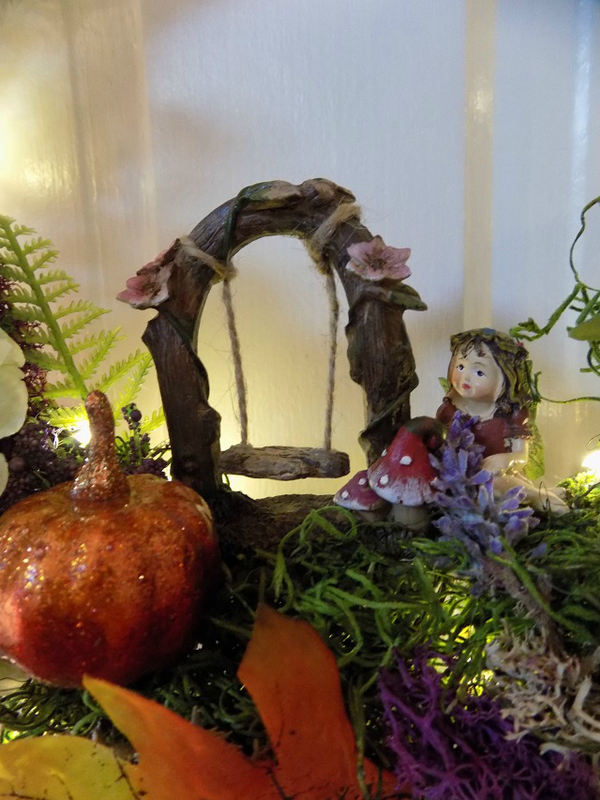 It only took about 10 minutes to transition my original Fairy Garden Wreath, for the Fall season. I didn't even use all of the ribbon, vase filler, or Fall leaves - so this transformation really wound up costing UNDER $3! 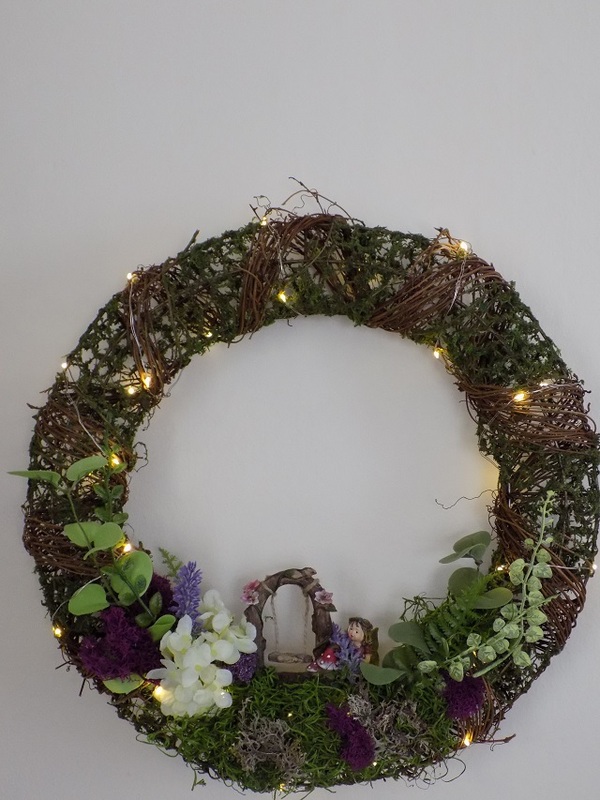 If you don't already have a Fairy Garden wreath hanging around to transform, that's OK! 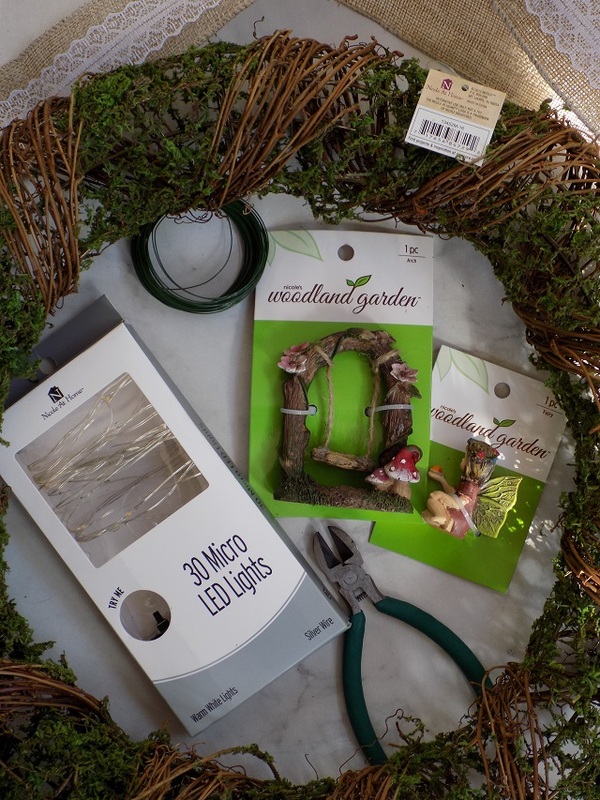 Read on for the full supply list from my original Easy Fairy Garden Wreath How-To, and a list of simple add-ins for Fall. Using your low temp glue gun and glue sticks, randomly affix fall leaves onto your fairy garden wreath. Now, also using your low temp glue gun and glue sticks, affix a mini foam pumpkin (or 2!) from your mixture of pumpkin and pine cone vase filler, to the inner rim of your wreath form (refer to images above and below.) Optional: Using your low temp hot glue gun and glue sticks, affix a few of the mini pine cones from the vase filler mixture (randomly) to your wreath form. 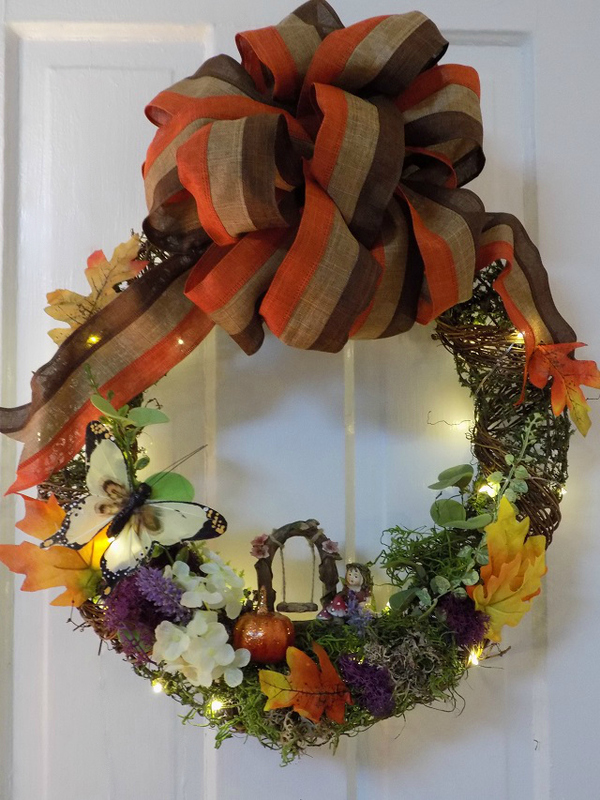 Create a fall themed bow for your Fall Fairy Garden Wreath, using wired ribbon of your choice and floral wire. Don't know how to make a bow? WATCH THIS VIDEO --->HERE TO LEARN HOW TO MAKE A CRAFT BOW! Starting from scratch? If you don't already have a fairy garden wreath to update for Fall, head over to my easy tutorial HERE on how to make a Fairy Garden Wreath! And, BONUS! All of the fairy garden items are currently on end of season sale/clearance at most craft stores! Happy crafting and happy Fall, friends!